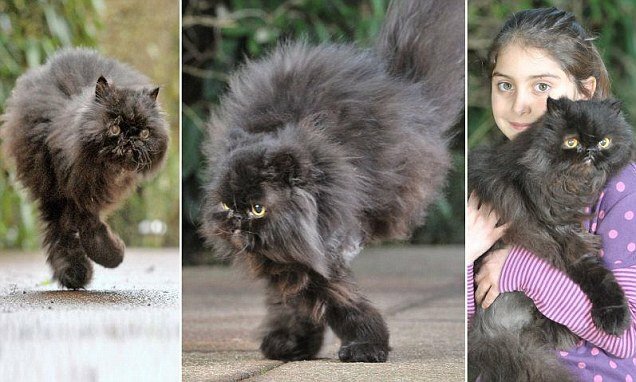 When black Persian Caffrey was three, he was run over by a car and lost his left hind leg. For the next ten years or so, Caffrey coped so well it was easy to forget his disability. But four months ago he developed a malignant growth on the repaired front leg. Caffrey’s owner Sue Greaves, 58, from UK, couldn’t bear to have him put down or put him through the pain of chemotherapy with no guarantee of success. When her vet sought opinions from four colleagues, all said it shouldn’t be done. They insisted he would be unable to walk and his life would not be worth living. Although he was expected to spend weeks recovering at home in Woking, Surrey, within days Caffrey had achieved near perfect balance – helped by next door neighbor Ashleigh Tyler, 8, who joined the campaign to nurse him back to health. And less than two months after the $6,000 operation, Caffrey is skipping along like a cat on a hot tin roof.